Today is Gift Package day for Christmas with the Cricut. I really love this cute box and wanted to show you how I made it, but when I went to Michaels and AcMoore they didn't have anymore paper mache boxes on the shelves:( So I decided to make a video of a smaller version of today's project. Supplies: Cricut Cartridges: Winter Woodland and Storybook, pattern paper, poinsettia flower, brad, satin ribbon, and a whole lotta love. 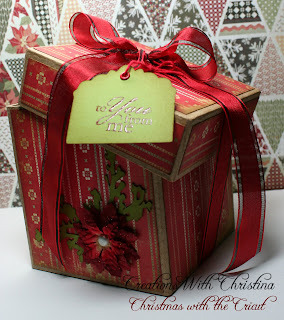 Now head on over to Teri's blog and check out her project for today. Teri is so awesome and talented, we have become such good friends. Thanks T, you are a sweetheart! Love your designs. Look forward to viewing past designs and future ones. These are very nice thank you for sharing your talents. Thank you Christina for sharing your talent with us!!!! I am really enjoying seeing what you & Teri have come up with! This little box is GORGEOUS!!! Great job, Christina!! Christina your gift box is beautiful! I can't wait to see what will be inside on Saturday. Great job! Your box idea is great! What a fun way to wrap a special gift for someone. I'm going to have to make a trip to Michaels and see if they have any. WOW Christina! This box is just fabulous! Seriously, it is just beautiful! You are so talented and thank you so much for sharing your talent with us. My mind is swimming with all the stuff I want to do now to find the time. Thanks again. Christina, your box is soooo cute! Who wouldn't want to receive a gift in such a cute box! Thanks for sharing with us. This is so pretty!!! I love the big and little box! Love your videos and your projects are always so beautiful. Please keep sharing your talent with us! Hi Christina! This box is just the bomb!! I LOVE IT! The paper is delicious - the video is another winner!! I love the way you photographed it also! I can't wait to make one of these! LOVE, LOVE, LOVE IT! Cute gift box Christina!! TFS I've signed on as a follower and invite you to visit my blog. Christina, I love you decorated boxes. They are perfect. I love them both, big and little one. The red one will be perfect for handmade Christmas ornaments. Thanks for sharing these. Sorry this comment doesn't have to do with this post but where do I get the code for your Grab Button? Very Cute Box, Great For Christmas!!! Always wondered what to do with those boxes! Cute box Christina! Our Hobby Lobby has bunches of those type boxes and I usually pass them up, because I think I have to use mod podge all the time... but just decorating with paper would be so much easier and way less messy!! Lov it! TFS! Very nice. How special gifts will be in these. Thanks so much. Love both of these boxes Christina. I would be thrilled to recieve either one of these from if I were on your gift list. Great job! Christina, Just gorgeous. The photography is beautiful too! Both boxes are really cute! Thanks for sharing! Thanks for your video on the paper mache box. It would be cute for any holiday or birthday. I will try and find the box at my local Michaels to make one. Keep up your great video's and cards. ooooh!! I love your boxes!!! Even the mini box is adorable!!! Thanks for sharing!! love what you do with the cricut.